Codema is Dublin’s Energy Agency and was set up as a not-for-profit limited company by Dublin City Council in 1997 under the SAVE II Programme of the European Union. It was one of 14 local energy agencies set up around Ireland to help local authorities meet their energy performance targets through professional development and implementation of good and best practice. 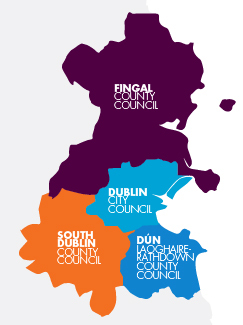 We work with Dublin City Council, Dún Laoghaire–Rathdown, Fingal County Council and South Dublin County Council. Our role is defined around the core function of supporting the local authorities in their own sustainable energy use. A second role is engaging with EU and SEAI funded energy programmes to bring innovation to the Dublin region. A third and increasingly important role is to increase energy awareness among the citizens and energy stakeholders in Dublin. Over the years, these three strands have become increasingly intertwined and integrated into a comprehensive local and regional service for energy and climate change. Codema's vision is for Dublin to be powered by clean energy, with zero polluting emissions. There will be affordable heat for all citizens in their homes, through excellent insulation and efficient energy from renewable sources. Good mobility will be provided by a public transport infrastructure that is independent of fossil fuels. Electricity will be fully decarbonised and any waste heat from industrial processes will be recycled for heating and cooling commercial and residential buildings. In line with the National Energy Efficiency Action Plan (NEEAP), we are also committed to achieving a 33% reduction in the local authorities' energy use for their own operations. To find out more about Codema, please view our most recent Annual Report.